Minis, Juniors, Seniors and veterans rugby tours to France in 2018 and 2019. Wanna come to France in 2019 and 2020? Wanna be in great rugby trip with us? France is probably one of the most beautiful countries in the World. Discover it with your rugby teams ! Like many other rugby coaches, get in touch quickly with our sport agency. Minis rugby tours or juniors rugby tours, ComeOn Sport will help you in setting up a good rugby trip! Let our knowledge & experience take the stress out of your next rugby tour ! Rely on us ! From the end of February, during schools holidays up to November, travelling to France with your rugby team is a great experience. 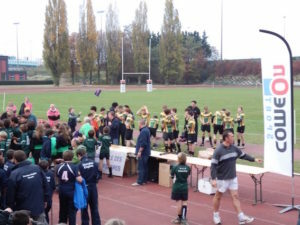 Every season, ComeOn Sport welcome sport teams in France is proud to provide arrangements for mini, junior and adult rugby teams here in out country. A rugby tour in France is always special and not only because of the language : the leisure activities, sightseeing and excursions available in France are ideal rugby teams ! Discovering France with your rugby team is always a good memory because of the french culture and assets. It’s a fantastic destination for a rugby tour offering the chance to test yourselves against the French style of play and train with great facilities in fantastic locations. ComeOn Sport propose a full range of rugby destinations for your team. Choose France for your next rugby tour in 2019 or 2020 and choose the french Specialists. To obtain approval from your rugby union and details, read our page about tour approvals. Special PACKAGES for RUGBY TOURS for Autumn 2019 & Spring 2020: visit our website to find out more and get ready ! The earlier you book, the cheaper it is. France is as safe country and all french cities and villages are pleased to welcome you. If you want to see the french culture, the french way of playing rugby and it famous “french flair”, get in touch with us ! All our rugby tours are fully customizable. Your rugby team is unique, so do your tour. What are you waiting for ? Drop us an email and come to France! We can provide you with a professional service that allow your team to enjoy special moments that will last a lifetime ! You are in safe hands with us. Rely on us, we are in the business since 2004! Looking to put together a rugby tour to France in summer of 2018 for a U18, U16 and U14 team. Total of approximately 60-65 people including coaches and staff. 8-9 nights would be ideal, tour to inlude matches with local clubs, coaching clinics from local professional clubs, sightseeing, half-board, transportation, hotel and travel from Miami to Paris. Thank you so much for the great tour we had in Paris in September. Very well organized. Super hosts! I would to say thank you on behalf of our rugby club. We had a very great tour in May and you did it very well ! Our kids and parents loved it and we hope you will come and visit us in Yorkshire ! See you in 2019 in France again an with your company again ! Thank you very much for the great rugby tour we had last week-end in your lovely country! The organisation and you, guys, were so so good! Our players and parents really enjoyed being in France. Merci beaucoup ! See you next year with the U14s !